Do you ever wonder what telenovelas are out there in Latin America? Novelas you may never get a chance to watch because they don’t air here? Do you ever contemplate what other twins have been separated at birth, leading them down remarkably different roads? Do you ever ponder who has stolen whose identity lately? I do, all of the time. “Mara” (who is smartly given away by her father, who can see into the future), grows up as the indulged and Super Annoying daughter of a fashion magazine publisher who lives her life on Instagram and sounds like a cross between ANY Kardashian, Fran Drescher from “The Nanny,” and the marriage of a snake to a chicken. -“Nina,” who doesn’t have any money, lives in a big, exciting house with lots of colors and doors, but only one bathroom, which is a problem. And Daddy Papi’s Mami, La Mecha. When Mara goes to prison, Mara’s father and his publicist Patricio somehow dig up Nina, to have Nina pose as Mara until some deal is finished. When Mara is sent to the Scary Women’s Prison (Episode 2 I think), the writers and actors turn the entire “Women in Prison” sub-genre of NarcoNovelas on its head, and it’s better is then anything! And if you look, you’ll find plenty of others!! 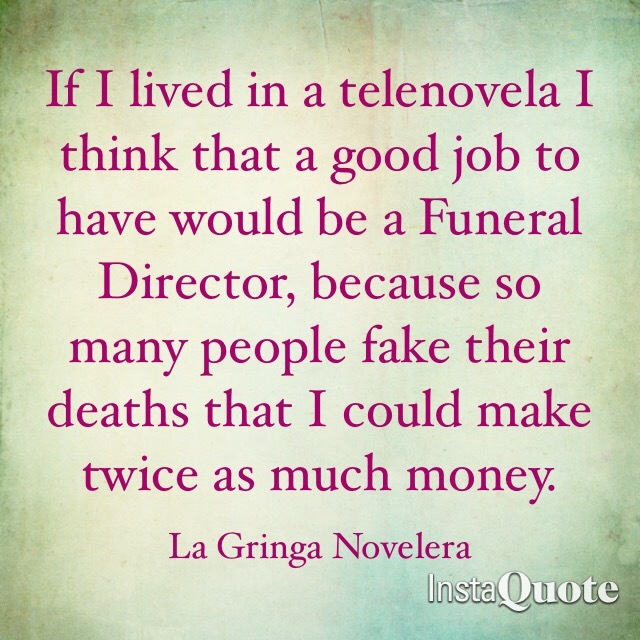 There is a whole world of Novelas out there!! And once you see one episode of any of these the shows, you’ll be hooked!